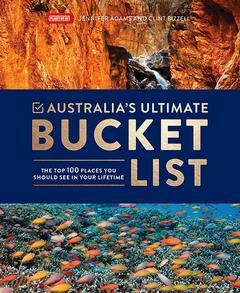 We all have those bucket list destinations in Australia the places in our own backyard that we plan to visit one day (before we kick the bucket, of course). Australia's Ultimate Bucket List is your guide to the most iconic and diverse destinations across this stunning country that you really should see in this lifetime. The 100 destinations featured have been curated by Jennifer Adams and Clint Bizzell from Network Ten's popular travel show Places We Go. Through Jen and Clint's experience, and with the help of public voting on the Places We Go website, this list covers every state and territory. You'll find famous destinations as well as lesser known places, including the shifting colours of Uluru, the immense desert landscape of the Nullarbor, and the vast marine organism that is our Great Barrier Reef. Featuring beautiful photography from each location, and with a map of Australia to help you pinpoint each destination, this book is the perfect gift for every Australian. Clint Bizzell enjoyed 12 years as an AFL footballer, playing for both Geelong and Melbourne. Clint and his partner Jennifer Adams are presenters for the Australian travel show Places We Go, which airs on Network Ten and is currently in its sixth series. Jennifer Adams is the author of many books including Remarkably Jane: Notable Quotations on Jane Austen and the popular Edgar the Raven series. Jennifer works as a writer and editor in Salt Lake City, Utah.